One sunny day three high school students Ara Cho, Hyun Bin Cha and Dong Min Seo have a day dream at the park in Incheon South Korea. Next day a mystery letter found by Hyun Bin at the burger shop. Hyun Bin shows the letter to his friends Ara and Dong Min. The letter sender's address is from Dubai and the letter's receiver address is in Incheon JEI University. Ara opens a few letters and starts to read them. Those words are so intrigued them so they decide to go inside the university and they're looking for the letter's owner. 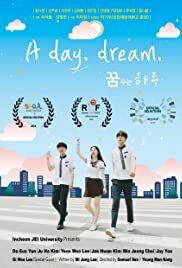 They have unexpected encounters when they are in the campus of Incheon JEI University and they pretend they are the students of this university. They discover many interesting departments browsing through the school such as the beauty care dept. , the nursing dept. , the beauty marketing dept. , the airline operation division and etc. Can the students find the letter's owner?